Alice McDermott, it seems, cannot put a foot wrong. Her latest novel The Ninth Hour has already been called “superb and masterful,” “immense, brilliant,” and an “enveloping novel.” From her earliest works, like 1998’s Charming Billy (winner of the National Book Award and an American Book Award) to 2006’s After This (Pulitzer finalist) and 2013’s Someone, a National Book Award longlist pick, McDermott has mined a rich vein of Irish-American ore for her books—but don’t let her hear you saying that’s all those books are about. As the author told me in an interview at a Washington, DC café, when you’re writing about fruit trees, it isn’t necessarily because you love apples. The Richard A. Macksey Professor of the Humanities at The Johns Hopkins University, McDermott is as charming and Irish as any of her protagonists, but she’s also much, much more. Bethanne Patrick: How do you feel about the state of the nation? 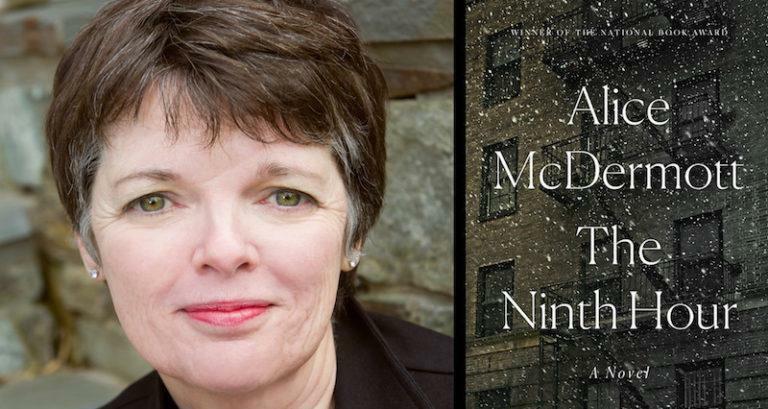 Alice McDermott: Something’s happening. I really do think so. I’ve been hearing it in all different ways. But I think that in real life, there is a kind of community forming unconsciously, of us saying we’re better than this, we’re nicer than this, we’re better to each other than this. I think you see it from the storms. In some ways it’s, “Let’s not bring politics into this,” in a very conscious way. BP: So how else are you seeing that? AD: When it really struck me, and as I’ve said I’ve been observing it in different ways, and talking to other people about it, but it struck me on Memorial Day. Every Memorial Day since I don’t know when, when we’ve been in town, we get up early and we go down to the Mall. When our kids were small we took them, and now we take our new dog, and we walk. It’s nothing planned, we just walk to the Mall, but we’ve been doing it year after year for some reason—maybe because we’re just creatures of habit, or maybe because we don’t have friends with beach houses! We stroll down to the Vietnam Memorial, and then we stroll back up again to where we park, over by the Corcoran. This year my husband and I both said, especially around the Vietnam Memorial, we never had so many warm and friendly conversations with strangers. On the Mall, on that day, so many people wanted to connect with each other—not about politics, but just about personhood. It was so remarkable that we both separately, were struck by this—almost couldn’t wait to get in the car and talk about it. BP: Oh, I love that. I love that. AD: I had the sense that people were wanting to say, “We’re better than this. We share this.” There were Vietnam vets, there were nurses, there were people who were not related to the military. It was not solemn. I mean, it was a really giving. There was a real sense of, “We like each other, and we want to express that.” We trust each other. We can strike up conversations. It was very American. BP: Is that something that connects to one of this book’s most interesting characters, Sister St. Savior? She’s an Irish-born nun who feels her calling is to find people in distress. BP: Well, this ties right back to what you were talking about at the Mall, is that the real American ideals that things don’t have to be the way they’ve always been. AD: I remember talking about this just outside Paris. There was a book festival, and one of the questions was about Americanism. We were supposed to be talking about Americanism. The conversation sort of came to this thing, and someone said, “But that’s not true of the black population, because they were brought as slaves. They didn’t choose to come.” And I had just read The Warmth of Other Suns, and I said, “No, but they left the South.” And that’s sort of the same idea, if you will, looking around and saying “This is not for me. I’m going to do something. I’m going to change something.” There is an immigrant mindset in the Great Migration. BP: One of your major characters in The Ninth Hour is Sally, who is so vital, a sun to many people in the book. When did she appear for you? What was her voice like when it first came into your head? AD: I think, and it’s probably clear from how she appears in the novel, that I had this sense of playfulness. Sally is someone from a new generation, who was not going to encounter her world in quite the same way as the previous immigrants had. And I think it was because one of the things I was sort of vaguely grasping at as the novel was being composed, was this idea of how we look at the past. We have sort of an inability—and maybe it’s a healthy thing—to take it too much to heart. How long can we keep the grievances? How long can we say, “Oh, the potato famine?” Or how long can we say, “My father was an alcoholic and so I’ve never been able to have a life”? Horton Foote has a play, and I’m blanking on the title. But there’s an elderly southern white woman who apologies for slavery to every black person she sees. It’s very dear, and very comical. She never stops apologizing. But it’s that balance. If you forget the past, you’re bound to repeat it. So my sense of Sally was, putting it in the American terms, this is a true American, who has a kind of amnesia, or a reluctance to look at the past. BP: Is that why you use the first person plural narrator? AD: Well, there it is again. There is that sense of uncertainty about the past with, I guess, the irony being, the danger of that kind of point of view. You don’t want to look at it, or say “That was them,” because that his how we begin to judge people only by our myopic view. I kind of like presentism, I think that is the word that has been thrown around in the academy. So to judge the previous generations by our narrow sense of what life is, and what life is about. It’s not something that I understood when I began. But it became for me, in some ways, that the way the story is told parallels the idea of faith. You have to have a kind of faith in what the past was. And, for the faithful in this book, there’s more than reality to be imagined. I mean, Christ’s life is imagined, right? It’s out of a book. The character of Sister Lucy looks at paintings, and that has more life to her. She understands that. It’s what she would rather dwell in than the world around her. She feels obligated to fix this world. BP: Is “the ninth hour” about having faith? AD: The ninth hour, I think, resides somewhere in between faith and doubt. I think the ninth hour is the place where we don’t know. I see the ninth hour as the moment of the whole world in doubt. The believer and nonbeliever alike. I think it’s that pause where no one’s sure, not even Christ. I mean, the man is dead. Everything we had hoped for, and believed may be right now confounded. He’s dead. The sky didn’t open up. He wasn’t taken off the cross. He’s dead. Now what’s going to happen? And in some ways, I think it’s very relevant to the way most of us look at faith in the 21st century. BP: But that, I think, is a really interesting thing, because we’ve come to a point in the 21st century of opening up our notions of faith. But the same time, as you’re saying, “Faith isn’t simply about religion or spirituality. Faith is about the very stuff of memories.” I think this ties back to what we first began talking about, with people looking for community. AD: I think a mistake that a lot of religious and nonreligious people alike make is that if you sign up for a faith, organized religion, then you’re done. You’re sure. And nothing in between. But I think we all dwell in the in-betweens. Doubt is as much a part of faith as belief is. Auden writes, of Christ’s death, “We had not expected us a stillness so sudden and so soon.” That’s death. That’s death, that stillness, that impossible stillness, of the physical being the moment after life has left the body. What do we do with that? BP: We’ve been talking about the uncertainty of memory. We’ve forgotten to ask what things mean, instead of just taking them literally. BP: So, how do you teach younger students about metaphor, and about the richness of texts? AD: It’s really not a matter of teaching it, it’s a matter of, sort of mining it. They already have the impulse. That’s why they’re writing fiction. That’s why they’re not journalists, or they’re not writing memoirs. They have that—you just have to, sort of—but they’re afraid of it, and it confuses them. Because that’s where the complicated thoughts reside [laughter], rather than, “Well, there’s going to be a murder at the beginning, and then the detective is going to come in, and then the mother’s going to yell at the father, and then the little girl will climb up on the roof and that’ll be the end of the story. Got it.” So, I actually [laughter] I’ve had one of my former students, who I’m always in touch with, who’s a lovely, lovely writer. She has, more than once, written to me and said, that I—and I didn’t even realize that I said more than once in the workshop, “What’s the why of this character?” I can see what the character’s doing. I get it. I get who the character is, you’ve given me that, I get what they—but what’s the why? Why? Why are you creating this character? Why are you making this fictional life? And, boy, you tap that, it’s there. It’s there. They have something to say, we all do. We don’t know how to say it until we begin messing with words and storytelling. It’s not that the story should be dismissed. Yes, we want to tell a story, but through that we want to approach that place where language fails us, where the story fails us. BP: Good, that’s exactly it. We need to approach that place where language fails us. Which I guess, our current President is doing on a daily basis. I’m sorry, I just had to. But, as writers and your students who, like you said, don’t want to be journalists, don’t want to be this, want to get to that place and then hang there. I believe third-person narration is the greatest artistic tool humans have devised to tell the story of what it means to be human. The post In Defense of Third Person appeared first on The Millions.